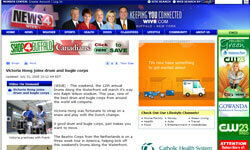 News reporter Victoria Hong joins drum and bugle corps WIVB (Buffalo, N.Y.) news reporter Victoria Hong, recently spent some time with the Netherlands' Beatrix, now on a three-week tour of the United States and participating in the Drum Corps International Summer Tour. Hong suited up in a Beatrix uniform with a snare drum to learn what it takes to keep the beat with one of Europe's top corps. Watch the video below. Riding the drum corps wave with Jersey Surf Western Howard County's (Md.) The View recently reported on local Jersey Surf members Mark Mangus and Evan Berry as they spend six weeks traveling and competing with the corps. Read the article on TheViewNewspapers.com. 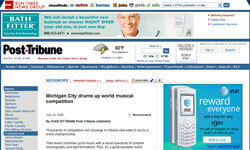 Michigan City drums up world musical competition The Gary (Ind.) 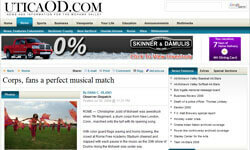 Post-Tribune reported on the upcoming kickoff of the 2008 Drum Corps International World Championships which will take place at the beginning of next week in Michigan City, Ind. Michigan City will host a special opening ceremony on Monday, Aug. 4 and then the Open Class Quarterfinals on Tuesday, Aug. 5. Read the article on Post-Trib.com.